In this introductory course the student will learn how to use RADIOSS to solve highly non-linear transient problems typical of impact. Users will be able to apply RADIOSS to evaluate product performance under loading that causes large displacements, large strains, contact and material non-linearity. Key theoretical aspects of an explicit solver are explained along with an emphasis on practical application including best practices. Users will learn how to build a valid simulation in RADIOSS by properly choosing elements and properties, and by defining basic material laws, contact and loading. A basic knowledge of finite element analysis. A basic knowledge of HyperMesh or HyperCrash. A basic knowledge about Pre and Post processing finite element models. 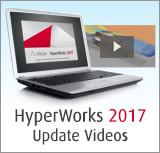 Access to HyperWorks (HyperMesh or HyperCrash, HyperView and RADIOSS).